Mountain pine beetles not only kill trees, they cause the trees to release volatile organic compounds (VOCs) that generate haze and pollution in forests, say the authors of a new study. The beetles trigger the release of these substances at 20 times the usual rate. The study, published in the journal Environmental Science & Technology, says this increased release of VOCs will create smog in parks, obscuring views of natural landscapes. More significantly, the increased levels of VOCs may harm human health and affect climate. 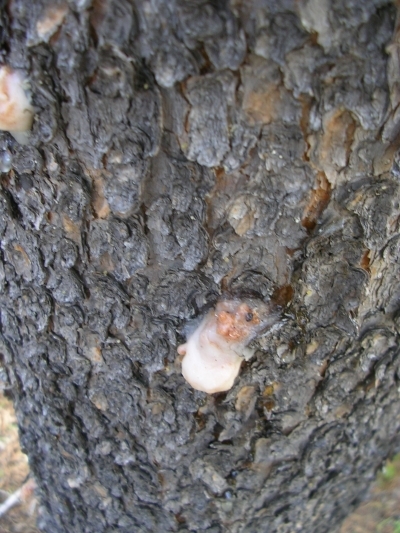 Trees attacked by mountain pine beetles release VOCs as a defense mechanism against the beetles. The trees emit these compounds from the bore holes the beetles create. The pine beetle is native to western North America, where it has infected more than 6 billion trees in the U.S. and Canada, say the authors of the study. Pine beetles primarily infest pines trees, particularly in dense pine stands, according to the U.S. Forest Service. As they chew their way through the inner bark of a tree, they deposit spores from a fungus that they carry, which blocks the conductive pathways of the tree. The tree fades to yellow and then turns brown red, often within a year. As the bark flakes off, the egg galleries where beetles deposit their larvae can be clearly seen, taking the form of winding passageways. The mountain pine beetle epidemic, which stretches from Canada to Mexico, has been exacerbated by warmer winter temperatures, says the National Park Service. Cold winter temperatures kill more eggs and larvae, slowing the beetles' progress, but the warm temperatures of recent years give the beetles an advantage.